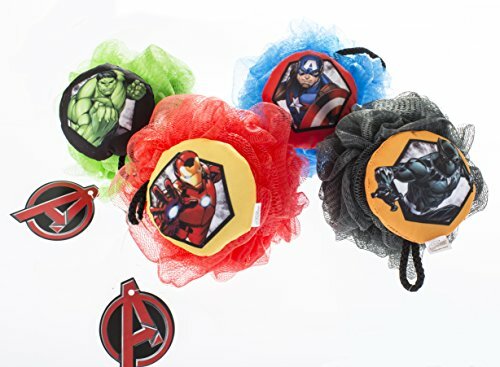 Make the bathtub fun with the help of the Marvel Avengers Loofah Set! From newborn babies to teenagers, everyone enjoys to rinse off with the help of something fun and useful. This 4 pack loofah set is like a toy meets a sponge. Kids can play with their favorite super hero while also getting scrubbed and clean! Perfect For All Ages: The Bradford Soap Marvel Avenger themed bath sponge four pack set is perfect for all ages. From infants, to toddlers, to kids, teens and even adults! The whole family can use this puff bath buddy to scrub away the dirt and germs! Combo Set: This is no ordinary set of sponges. This set makes the bubble bath or shower fun, thanks to the help of Iron Man and his friends from the Marvel world of superheroes! This set includes Iron Man, the Hulk, Captain America, and Black Panther. Antibacterial Scrubby: Nothing works better than a loofah at scrubbing away germs and bacteria. WIth the help of some bath or body soap, you or your toddler will be clean as can be! Great Gift: A great gift for a kid, at a great value. With 4 large and puffy sponges in the set, you will be shocked by how long they last! Gentle Yet Effective: The gentle touch of the sponge is smoothe on the skin, yet when scrubbed, the durable mesh will scrub away germs and bacteria. If you have any questions about this product by Bradford Soap, contact us by completing and submitting the form below. If you are looking for a specif part number, please include it with your message.